Email marketing software company AWeber Communications has recently moved into a new, LEED Gold Certified headquarters in Chalfont, Pennsylvania. The 71,000 sqft office was designed by Wulff Architects to express the company’s core values through architecture. 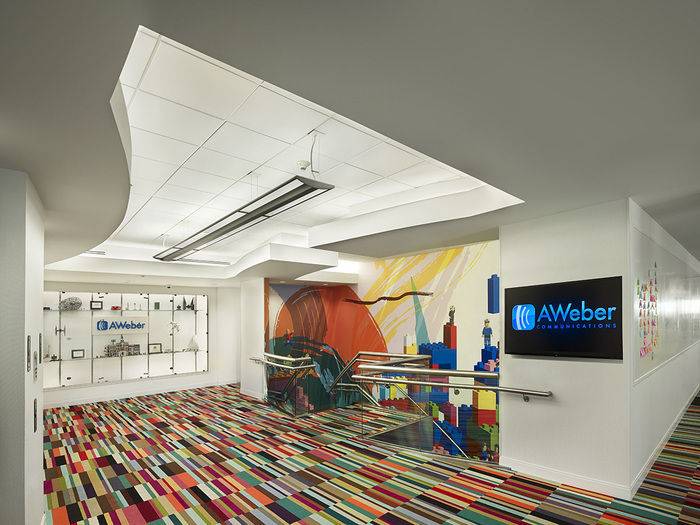 “AWeber Communications: To accommodate a growing business, AWeber relocated their world headquarters and seized the opportunity to exemplify their “Core Values” in an architectural design that both physically enables their philosophies and expressively symbolizes them. Their new facility creates a remarkable experience by embodying their passion for collaboration, innovation, sustainability, and fun. Collaboration- AWeber’s headquarters is the epitome of flexibility, providing mobile workstations which promote collaboration and facilitate creativity. Throughout the open work areas is playful furniture, over 3,500-square-feet of writable wall surface, and informal gathering spaces to promote interactions that nurture teamwork and innovation. The environment promotes idea sharing through a flat spatial hierarchy, with the CEO working in the open area using an identical workstation as all team members. Innovation – Dedicated rooms in the core of the building enables teams to hold impromptu discussions. Individuals can find privacy in refurbished British phone booths and quiet rooms. A mural by a local artist and executed with the participation of the AWeber team wraps the grand staircase, providing a colorful tribute to how the team works to help small businesses grow. Additional stylistic gestures, echoing the mural’s composition, weave a common theme throughout the building. Sustainability – LEED Gold certified with 100-percent of all carbon emissions offset through renewable energy certificates. The techniques of Biophilia, including a living wall, 2 story rain curtain, and an outdoor cafe increase access to nature and improve air quality. Energy is managed by predicting energy usage, and measured against actual usage. Energy efficiency is achieved through daylight harvesting, superior HVAC equipment and controls, intelligent data center design, energy efficient appliances and highly-efficient personal computing. All electricity usage is offset with renewable energy generation certificates. A 20 foot Bio-wall featuring over 2,000 plants increases oxygen and air quality. A two-story rain curtain provides access to nature. Daylight harvesting reduces energy consumption. Floor-to-ceiling windows brighten the entire office with natural sunlight. Window shades automatically adjust based on the position of the sun. Toilets, urinals and faucets are low-flow water-efficient. A state-of-the-art building management system monitors over 50,000 points in the building every 15 seconds, providing optimal light and temperature control and minimal waste.